Confronted with the sudden emergence of hundreds of unsolved homicides, Tallow soon discovers that he's walked into a veritable deal with the devil. An unholy bargain that has made possible the of some of Manhattan's most prominent captain's of industry. A hunter who performs his deadly acts as a sacrifice to the old gods of Manhattan, who may, quite simply, be the most prolific murderer in New York City's history. Warren Ellis' body of work has been championed by Wired for its "merciless action" and "incorruptible bravery," and steadily amassed legions of diehard fans. His newest novel builds on his accomplishments like never before, announcing Ellis as one of today's most daring thriller writers. This is twenty-first century suspense writ large. This is Gun Machine. 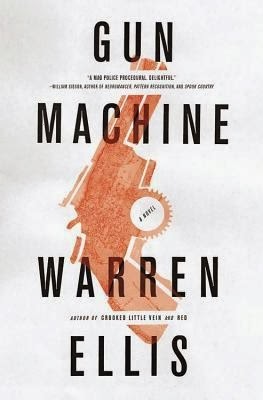 How I came about picking up Gun Machine by Warren Ellis is a mildly convoluted story of mistaken identity. The book appeared on a recommendations page and immediately the name struck a chord of recognition. Upon further inspection one finds out Ellis did significant amount of writing in the comic book industry. I read comics! I must know what he wrote! Then, as I read the reviews for Gun Machine (and his earlier work) I see he tends to write somewhat over-the-top gore (I'll go into that in a minute) and it hits me. Punisher Max! I'm totally picking up this book. And I did. And then I realized that it was Garth Ennis that wrote Punisher. Ennis. Ellis. Oops. Ellis has written numerous things you would know whether you're a major comic book geek or not. Look it up. Regardless that it was mistaken identity that pushed me to move this to the top of the read list, I am glad I picked it up. Story time is over (ha!). Review time. On to the gore! Ms. Au Lait and I like our TV. One of the shows we watched quite a bit of was Bones. 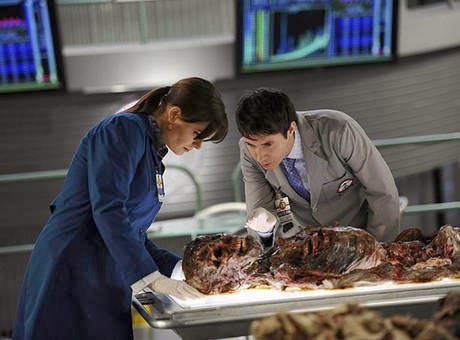 Bones is a sometimes humorous police procedural that utilizes forensic anthropology to solve crimes. Though the show is generally light-hearted, the premise requiring an anthropologist to solve murders requires that the crimes exhibit a certain... grotesqueness. As such, the bodies on the show are generally characterized as some of the more "gross" things in police procedural TV these days. However; this more a side-product of the show, not what the show is actually about, which is character and case driven. I would make the same argument for Ellis' work. Yes, there is gore. Yes, it is a little over-the-top at times. 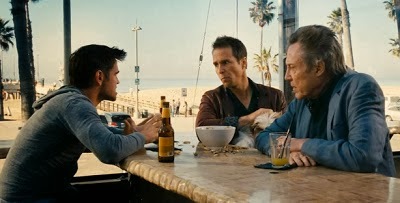 However, it is a side-product of a story of a downtrodden NYC detective who just lost his partner, who is having a complete change in his outlook on life, and who is also on a case for a prolific murderer. This is a police procedural. Murders have been committed and the case must be solved. But this has a flair that Ellis brings to his works. His characters are witty and quirky (protagonist and antagonist alike). The action is immediate and non-stop. My only complaint (and it's not a bad one I suppose) is that the ending comes too fast. There is significant buildup to the climax, but the climax happens extremely quickly. I would have liked to linger a little longer in heat of it. In conclusion. This is a book with entertaining characters and an imaginative plot. And if I've learned anything from books, TV and movies it's that you need to enjoy the little things.